I fear there’s a little bit of [marketing] that is hard to understand so when people go comparison shopping they just pick based on price or the first one to contact. It’s one of the reasons that I’ve been super fast in responding when I can. I know I don’t win price, but I might win fast. I think there is a lot of truth to their insight here. When a business is looking to hire an agency, usually the biggest factor in deciding who to respond to and choose is who responds to your inquiry first. And it makes sense. You’re a business owner, not a marketing expert. Or you’re a marketing director, but you need help with a channel that you do not know well (such as SEO). I’ve done it before. I was looking to hire a consultant of sorts, and after leaving voicemails/messages for four or five I finally spoke with one on the phone. I hired her. But is this the best way to hire? No. It’s important, but it’s just the start. So what should you be looking for in an agency? Let’s talk through how to evaluate an agency and their proposal for you to engage their services. I live my life by the mantra of “communication solves all problems”. I learned this while working for Distilled in New York City, where we had it written along the top of the main whiteboard in our office as a daily reminder. When you prioritize speaking with an agency or consultant because they responded to you first, you are essentially saying that you value fast communication. Maybe this is part of your company culture, but whatever the reason you value speed. That’s something to listen to. But this speed to initial contact is something that can be learned by even a semi-intelligent salesperson. What really matters is how well and frequently they communicate with you in your choosing process. Are they attentive to your questions and feedback and genuinely looking to educate you, or do you just feel like another sale to them? Are they providing you clarity about how their process works and next steps? Are they getting back to you when they said they would, and if they’re going to be delayed are they communicating this? I wouldn’t take tardiness on getting you a proposal as a warning sign necessarily, as they may just be paying close attention to detail and getting it right. Not telling you that they will be late getting you their proposal is a red flag, however. is frustrated trying to communicate with their provider. See, it all comes back to communication. When you’re having initial discussions with a potential marketing provider, you need to ask them about their ways of working and see how that meshes with your own company’s way of working. For example, if you are a traditional 9-5 business then you may work in long timelines and changes can take a while to get into place. And more importantly, everyone goes home at 5pm. If your provider is in a markedly different timezone or they like to communicate late at night or on the weekends, or they are allergic to scheduling consistent meetings when you run off your calendar, then you should probably not work with them. I counsel consultants the same thing – they need to find clients who work similarly to their way of working. If you like to work fast and communicate asynchronously in Slack/SMS/email, then find clients who do that too. If you like to send the occasional update email but don’t like the phone, find clients who want that. Culture and working patterns matter in consulting. Now comes the fun part. You’ve received proposals from the providers you have been speaking with and it’s time to evaluate them and make a choice. While these two absolutely matter, you shouldn’t be surprised by either of these areas if the provider has done their job with setting your expectations for what they will propose. They should have taken the time and have the expertise to be able to gauge your budget level and what you need, as opposed to what they need. If your project is not the right fit for them, for a myriad of reasons, they should not be pitching your business at all. Period. [ ] Did they pay attention to what your business needs and build their proposal around that? [ ] Have they included expected outcomes, not just the activities that they will do? [ ] Do they speak to the metrics that matter most to your business? 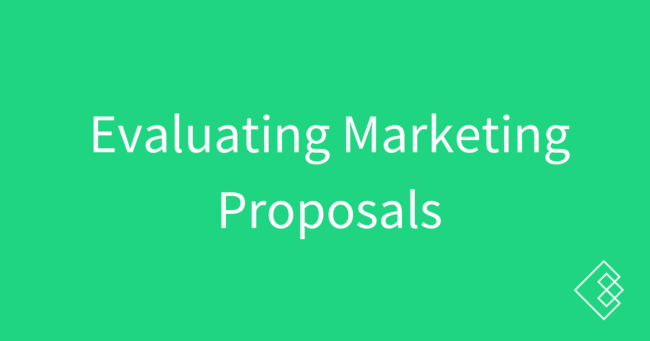 [ ] Is the budget they propose within your range that you communicated to them? [ ] Do they break down pricing so that you know what you are actually paying for? [ ] Do they give you clarity about what you can expect of them in regards to outputs? [ ] Do they give you clarity about how often you can expect to speak with them? [ ] Have they given you a schedule for when they will report progress and the important metrics to you? These are all table stakes for a marketing proposal, in my opinion. Notice that I haven’t said anything about design or speed. Design absolutely matters and one of the biggest wins I can often have with agency clients early on is fixing their proposals, including spelling, design, and communication of services and pricing. But, you need to train yourself to look beyond slick design or being quick to respond. What’s more important is the substance of the proposal and if it meets your needs. I’ve too many times seen businesses hire the first agency who responds to them because they were a) fast and b) had polished proposals. Ironically, the best marketers I know have text-only two-page proposals and contracts. I don’t see high-powered consultants spending hours on polished proposals. They come in as subject matter experts and that speaks for itself. I should know – I’ve closed multiple hundreds of thousands of dollars of consulting work without ever putting together a PowerPoint proposal.